So, I bet you'd all like to know who won the giveaways wouldn't you? Well, I'll announce it at the end of the post, but for now I've got some other things to share! In my last post I showed a picture of a little project I was making for a friend. Would you like to see it completed? I made this menswear bunny for Karyn of The Workroom to brighten up her day. Karyn had a rough day before our last Quilt Guild meeting and then had her digital SLR stolen right out of the store recently - and she loves bunnies! And underneath you can also see a bit more of the new quilt design I'll be taking to Market. I'm not sure I actually like the fabric with this pattern (although I do love Aviary), but I'm sure I'll figure it out. 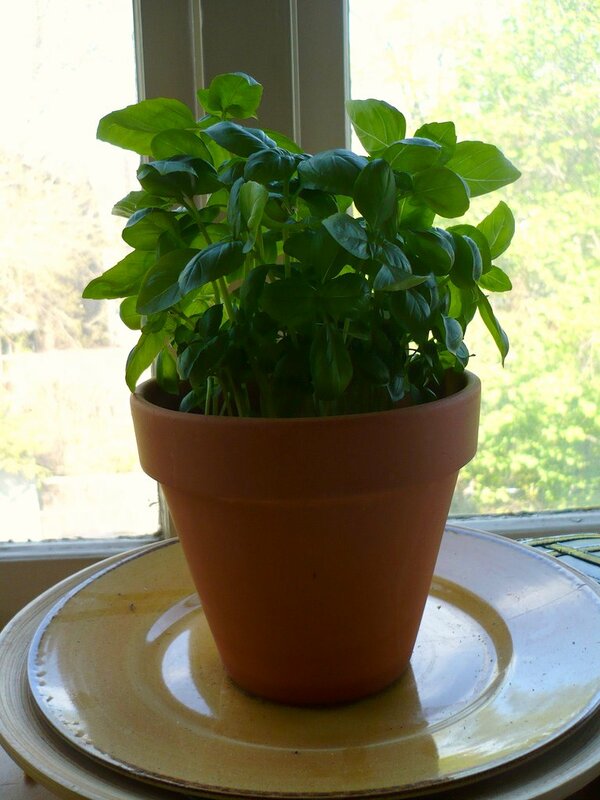 Today, I bought a basil plant. Alex and I had talked about it buying one all last summer, but never ended up doing so, so I went for it. These "sammiches" were inspired by the ones that Erica made for our picnic in High Park except that I roasted the tomatoes and used an herbed goat cheese. They are soooo tasty and pretty healthy too. 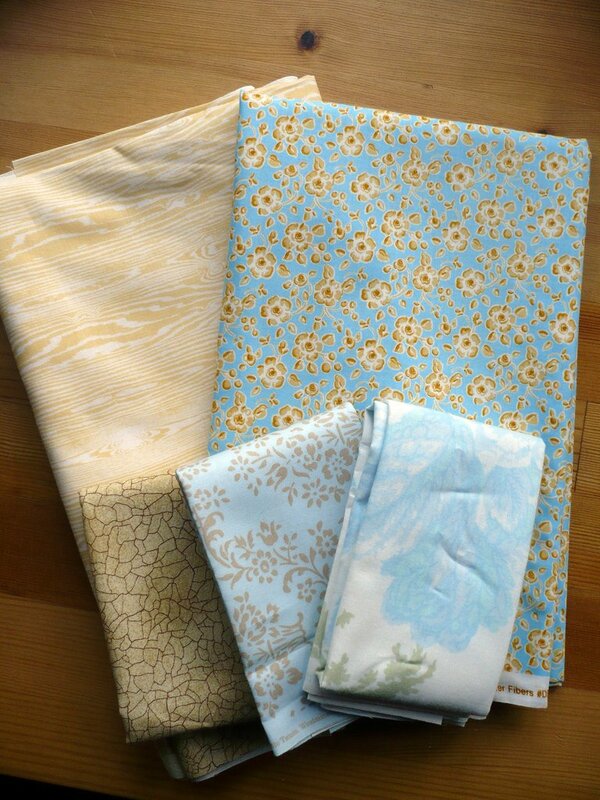 Yesterday I went to Quilt Guild meeting and picked up some fat quarters (we hold our guild meetings at Karyn's shop). 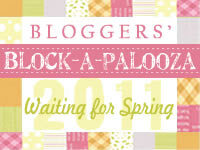 These are from Katie Jump Rope by Denyse Schmidt, Summer Soirée by Paula Prass, Dolce by Tanya Whelan, Love by Amy Butler, and Hushabye by Tula Pink. I can't wait to use them! 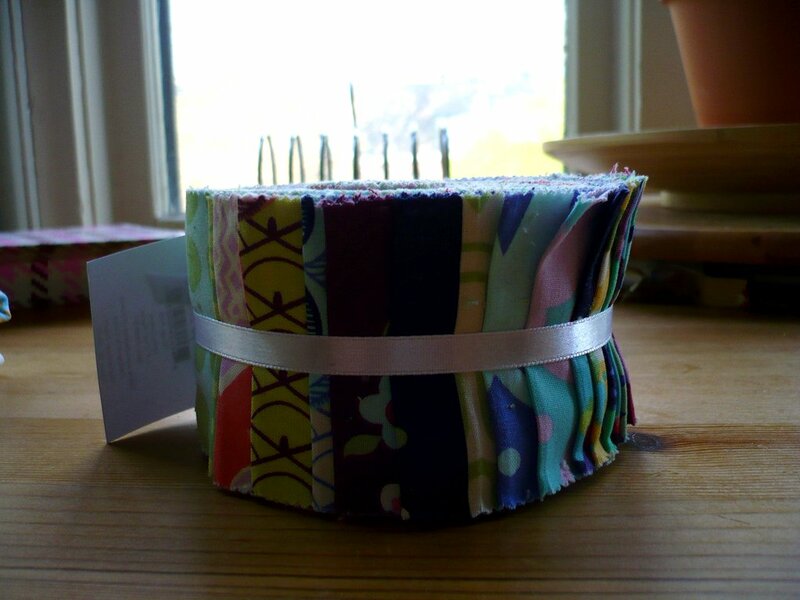 Today, I also got some fabric mail, yay! This is a design roll of all the prints from Amy Butler's Love collection; it will be used in one of my designs for quilt market. I wasn't sure at first if I liked this collection, but it has grown on me and there are a few prints that I am absolutely in love with, like Memento in Burgundy. Also, did you know that Westminster has a preview of Amy's new line up on the site? It's called Soul Blossoms; again, I'm not sure if I love it, but I'm sure it'll grown on me! I also got my order from Sew Sisters here in Toronto. This is some of the yellow woodgrain print from Joel Dewberry's Aviary collection, and a print from Dena Designs' Rambling Roses collection. 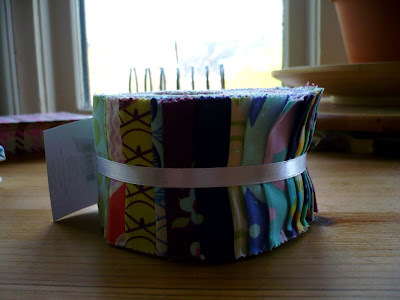 The three fat quarters on the bottom (two from Annette Tatum's House collection) were a free gift from the gals at Sew Sisters who are having a little special right now - for every metre of fabric you buy, you get one fat quarter! This equals awesome! And I'm pretty sure it was on purpose that the free FQs match so well to the fabric I ordered! Congratulations you two! Shoot me an email (kayecprince [at] gmail [dot] com) and I will have your prizes in the mail soon! I had so much fun doing this giveaway and I'm so happy to have met so many new people! I've been wanting to make that little bunny for a while- I even have the fabric and everything! Seeing yours makes me want to get to it! Aw! The menswear bunny looks great! What a nice thing to do. I think I need to pick up a basil plant, as well. I'm so glad you enjoyed those sammiches enough to experiment with them! Ooh ooh ooh that's me!!! Yay thankyou for having such a great giveaway, and double thankyou for picking me as a winner!! I could so totally dive into those sammiches... talk about tasty looking!!!! Hi Kaye! Just wanted to let you know that your fat quater arrived for the Sew Mama Sew swap! I love it!!! THANKS! Jeanelle R.